This article is about a state in southeast Austria. For the region in Slovenia, see Styria (Slovenia). For other uses, see Styria (disambiguation). Styria (German: Steiermark, German pronunciation: [ˈʃtaɪ̯ɐˌmaːk] ( listen), Slovene: Štajerska, Hungarian: Stájerország, Czech: Štýrsko; Slovak: Štajersko) is a state, or Bundesland, located in the southeast of Austria. In area it is the second largest (after Lower Austria) of the nine Austrian federated states, covering 16,401 km2 (6,332 sq mi). It borders Slovenia (Carinthia Statistical Region, Drava Statistical Region and Mura Statistical Region) and the Austrian states of Upper Austria, Lower Austria, Salzburg, Burgenland, and Carinthia. 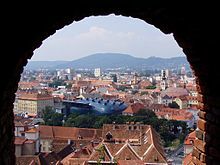 The capital city is Graz which had 276,526 inhabitants at the beginning of 2015. In subsequent elections in 2010 and 2015, the Social Democrats, the Austrian People's Party, and the Communist Party each lost between one fourth and one third of their shares of the vote relative to 2005. The Freedom Party grew from 4.6 percent to 26.8 percent. 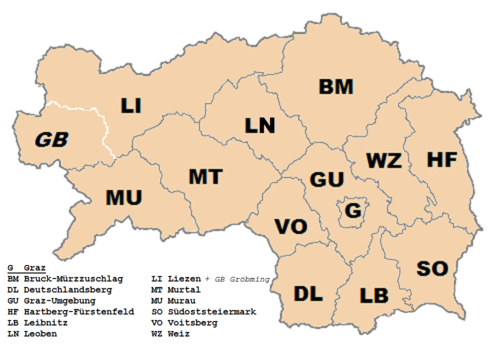 The current government of Styria is a coalition of Social Democrats and People's Party, with each party holding 4 seats of the 8 seats available. The governor, Hermann Schützenhöfer, is a representative of the People's Party. His deputy, Michael Schickhofer, is a Social Democrat. ^ Lesser, Shawn. "Top 10 cleantech cluster organizations for 2010". Clean Tech Group. Archived from the original on 22 May 2011. Retrieved 14 April 2011. ^ "Skepsis gegenüber schwarz-roter Neuauflage". ^ "Schwarz-rot in der Steiermark".